How many more games until Russell Westbrook comes back? Not meaning to bring everyone down after such a big, December win against Charlotte Friday, but I’d be real surprised if there isn’t a giant white board in the Thunder offices with a "Westbrook Returns" countdown. It’s 26 now, by the way. There’s a fun fact for you to think about until the Thunder play again â which will be Sunday in Oklahoma City against the Rockets. And here are three other things we learned from the 89-85 win. OK, well, you kind of knew Durant was going to play with a purpose Friday night. You know, because Westbrook wasn’t there, so it was a chance for Durant to show what he can do. But Durant doesn’t have to do that. Durant has nothing left to prove. He can carry a team, we know that, so whatever he does or doesn’t do against Charlotte in a December game doesn’t really matter. And while Durant had a remarkable fourth quarter, hitting a pair of 3-pointers late that helped the Thunder hold off Charlotte, scoring 14 points in the final 12 minutes, he took a season-high 28 shots. Maybe Durant felt like he needed to do everything himself. Maybe he didn’t trust his teammates. Who knows. What we do know is Durant better quit if he’s guilty of any of the above. The Thunder have shown themselves as one of the deepest teams in the league. The bench is diversified and talented. Serge Ibaka has been sensational. Reggie Jackson won’t have a problem assuming the starting role. Durant certainly knows that. He also knows he can do it all â 34 points, 12 rebounds, six assists against Charlotte. But he doesn’t have to. Durant didn’t need to fire up 28 shots. That’s not his game. It looked like he was pressing. 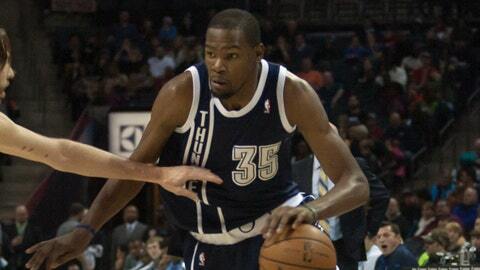 More of that, against a team better than Charlotte, and the Thunder could be in real trouble. OK, it was one game, but this is not the Reggie Jackson we’ve seen most of this season. Perhaps Jackson had the same issue as Durant on Friday night: A bit too much effort when neither needed to press. Jackson put up a career-high 19 shots. That’s not his game, either. His role changes from sixth-man to starter. That doesn’t mean shoot it so much, though. Jackson was just 4-of-19 for 10 points. Westbrook is out, and now is the time the Thunder need Jackson more than ever. Jackson should be ready, too. He was in the same position a season ago when Westbrook went out in the first round of the playoffs. And this season, averaging a career-high in points, minutes, rebounds and assists, Jackson has shown himself to be more than just a capable player, he’s proven himself to be a starter. But he sure didn’t look like it Friday. OK, it’s one game. No need to panic. At this point, we’ve seen enough out of Jackson to realize what kind of player he is. Give him a pass for his efforts on Friday. Let’s see what Jackson does Sunday against Houston. No, not about the close call to Charlotte, although that does merit a bit of concern, but about Westbrook’s health. This is now a third knee surgery when it looked like one would be enough. Does anyone think the most-recent will be the last? That’s what’s most concerning to me. Westbrook’s right knee seemingly was fine. He had a triple-double Wednesday against the Knicks and was pain-free according to general manager Sam Presti. According to the Thunder, Westbrook’s newest issue was something unseen by doctors over the past few months. But what I see is more of the unknown. While it looked like Westbrook hadn’t lost a step from seasons past, clearly the Thunder management was concerned there would be larger issues in the future. That’s the reason for the surgery. There was swelling taking place so it needed to be addressed with surgery. The question is whether this surgery will ultimately be the one that’s the last surgery. It’s a fair one to ask. It’s fair to be worried because there’s no reason to think this is the last time Westbrook will miss an extended period of time or why he was experiencing swelling that wouldn’t go away. Westbrook wasn’t available for comment Friday. Presti was. He said he’s proud of his team and disappointed for Westbrook. "I’d expect us to improve from this adversity," Presti said. "A lot of our progress as a team has come from some of things that have been thrown our way." This is a lot. Hopefully it’s the end of it, but don’t be surprised if there’s more.